First off, let me say I'm definitely not a technical wizard when it comes to the complexities and details of building a custom PC that has seven watercooled graphics cards in it. I do, however, absolutely love high performance machines that look great on the outside and function well on the inside. To me, computer hardware is the same as engine parts. Sleek cases are the body, and GPUs/CPUs are like the engine and transmission. They are toys made to perform. This post focuses on the the intentions I had set out, the process and experience of the build, the components, and the results of the final build. It's fairly subjective, but I hope it's helpful as you might be thinking of this build as something suitable for your needs. If you're looking for more thorough, technical details about similar builds and GPU rendering, a great resource is Tom Glimps - he's incredibly up to speed on all of this stuff. My goal was pretty straightforward - to build a second, primary workstation packed with as much GPU rendering power as possible, while considering stability, good aesthetics, and cost (in that order of priority). My other PC build is a Quad Titan X watercooled machine. These both work alongside my Mac Pro - which I still work on for some day to day tasks. Time is money. Time saved is money saved, and time spent is money spent. And since time is the only depleting asset in life, I think it to be wise to invest in things that can not only help your bottom line, but also can shave days down to hours and hours to minutes, minutes to seconds. You get the jist. Since I make an image everyday, and I like to push those images as far as I can with the time I have, it made sense to cut the render times down. It allows me to spend more time in the program working, and less time rendering. Currently, the dailies are rendered at 3600px - and render times can take about an hour - sometimes more or sometimes less. That's 365 hours of rendering each year. If that could be cut in half or a third, then we're saving about 180 hours - which is a lot of time, and/or money. Added to this, when commercial projects are rendering, they sometimes had to be put on pause so I could finish a daily. Having an additional workstation keeps the commercial project rendering on one machine while the daily is worked on. Once the everyday is rendered, I enable Octane's network rendering for both machines to finish the commercial project. So, for both personal and commercial productivity and efficiency - it made sense to look at another build. Originally I had only thought to build another Quad GPU PC. 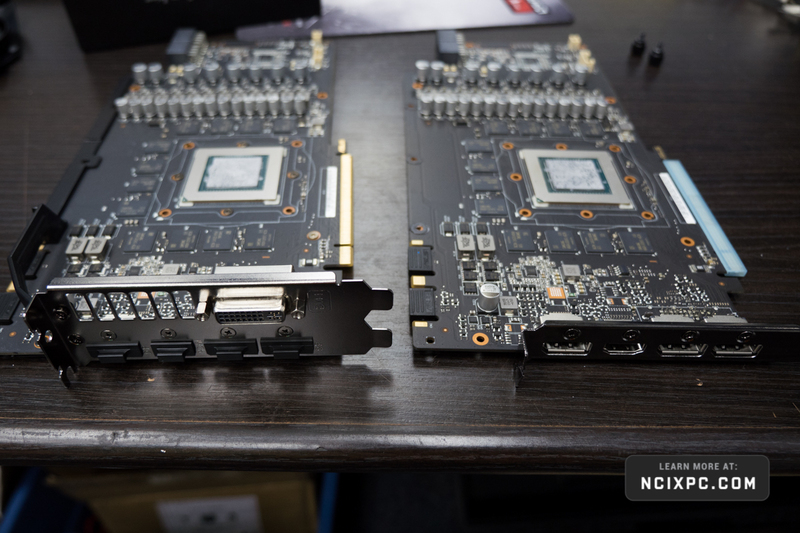 I knew about the Amfeltec setup, but the idea of GPUs hanging out in the open did not appeal to me. We have a cat, and she's often too curious for her own good. Plus I wanted something that looked nice, and was cool and quiet. I watched this video (jump to 6:27) and it spiked my interest since it showed EK's new hepta block. I had known about the single slot modification that some were doing to their cards, but I was slightly terrified about doing this - as it would void the warranty on seven $900 graphics cards. That idea did not appeal to me whatsoever. I reached out to the team at NCIX, who had built my first rig, and discussed how to make this happen. At the time EKWB had stated that the Hepta water terminal would not be available commercially, only to post it for sale a few weeks later on their website. Then there was the issue of the single slot cards. Since this build was no ordinary feat, the team at ASUS went all out and engineered a custom single slot backplate modification. Why they don't have a variant like this in their product offering I'm not sure - but I hope they consider it. Many, if not all, GPU render machines could benefit from it. What this meant was that the warranty on the cards would be retained, as the modification was being made by NCIX, and not some crazy person with a Dremel (me). That sold me on it - we could move ahead with the build. Having the machine now for almost a year, I'm happy with my decision. It has already pushed through many render heavy projects, and has allowed me to iterate through work incredibly quick. With the new GTX 1080ti finally here, there are some serious performance machines about to be assembled I'm sure. I had originally wanted to wait for these cards, but now am glad I didn't, since Octane and the new Pascal architecture, at the time, was still being optimized. It is interesting to see benchmarks on the new cards and with the ORC (Octane Render Cloud) coming to fruition, there will likely be cheaper alternatives for those who have less consistency in their day to day rendering needs. I'm crossing my fingers that companies like NCIX, Maingear, Digital Storm (and the host of other custom PC builders), as well as ASUS and EKWB, will start to look at GPU rendering as a unique market. I'm also hoping Nvidia is listening and will start to produce single-slot versions of their top tier GTX cards in the future. By providing certain products or components like these, there are huge opportunities for everyone to create work more efficiently.